What’s the King of Gems? Ruby is used as the Anniversary Gifts for the Wonderful Years of the 11th, 15th, 40th, 60th, and the 95th Anniversaries! 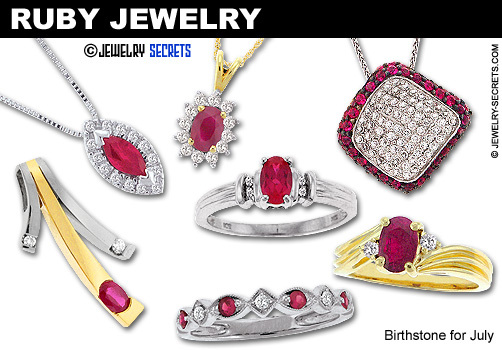 Ruby is also one of the 3 Most Precious Gemstones in the World. 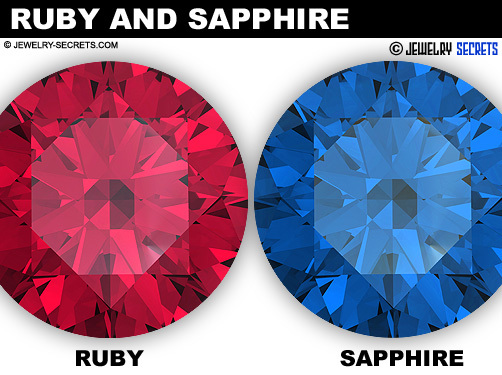 Right next to Sapphire and Emerald (see below). You see, Burma (Myanmar) puts out the BEST Rubies in the World (or more often than other countries). The stones are Vivid, Deep, Rich Red Rubies that look like Pigeon Blood or Pomegranates. 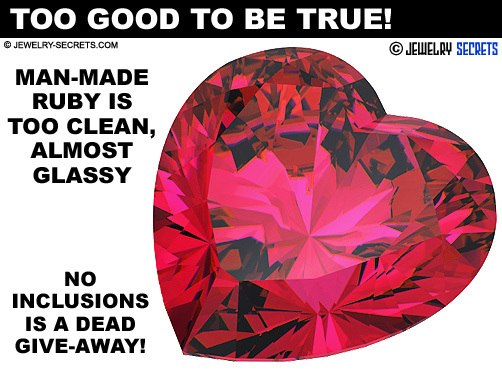 But, like all mines, just because the Ruby is Burmese, doesn’t mean it’s Good Quality! Ruby Quality will vary from Stone to Stone, and High Grades of similar Color can come from Vietnam or Africa as well (among the many other world-wide mines). Medium-Dark toned Rubies are the Most Preferred. 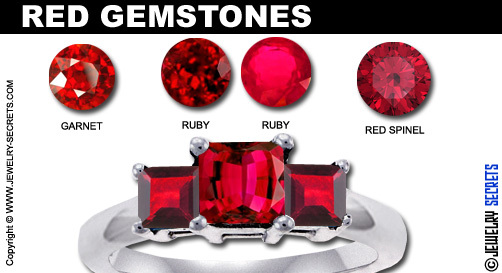 The Color of the Ruby is actually the most Significant Factor when it comes to Pricing and Cost. Rubies come from a Parent Rock called Corundum. Corundum in it’s Pure State is Transparent or Clear (Colorless). When traces of Chromium get mixed with the rock during creation, it makes the Corundum RED. Corundum is also what Sapphires come from. 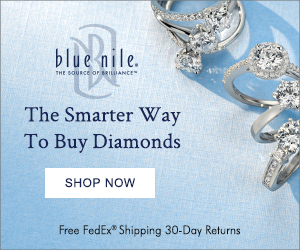 Sapphires have the Same Physical Characteristics as a Ruby, but the Blue in Sapphire is actually caused by Titanium and Iron. It’s the Color difference that separates the two. If Corundum is Red, it’s a Ruby. If it’s any other color of the Rainbow, it’s a “Sapphire” (Pink Sapphire, Yellow Sapphire, Orange Sapphire, Green Sapphire, Blue Sapphire…). The name RUBY comes from a Latin word for Red (Rubeus). This Rubeus Stone has been mentioned in the Bible 4 times. It’s also associated with Wisdom and Beauty! 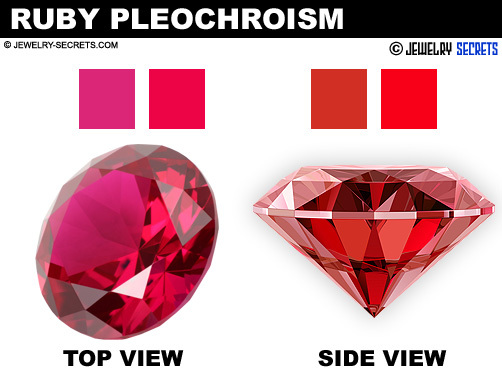 The interesting thing about Ruby (and Sapphire as well) is the fact that it’s Pleochroic. Pleochroism is where the Stone can look like Two Different Colors or more when viewed from two different angles. These Commercial Grade Stones are generally imported from Thailand (the US imports more Rubies than any other country). 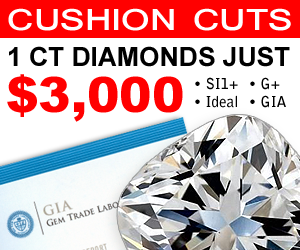 Any Ruby over 1 Carat is considered Rare, and finding a Ruby with No Inclusions is Practically Impossible! Rubies are known to have Clarity Characteristics like Rutile Needles (Silk), Crystals, Growth Lines, Color Banding, and Finger Print Inclusions. It’s just the nature of the stone. Birthmarks like these are common, add Personality to the Stone, help Deepen the Hues, and makes it Easier to Identify the Gem. But, if the Stone has too many of these Inclusions in the stone, the Stone can become Weak and even Brittle! You shouldn’t have to ever worry too much about the Durability and Hardness of Ruby in most Stones though. It’s the Second Most Hardest Stone there is on the Face of the Earth. 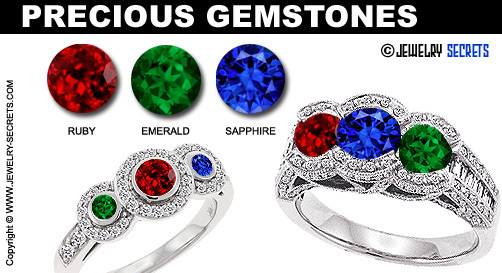 Rubies (and Sapphires) are a 9 on the Moh’s Scale of Hardness (Diamond is a 10). 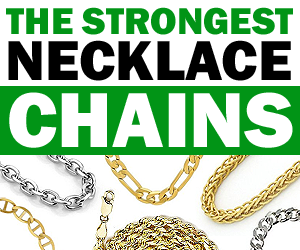 Because of this, they are Very Durable and make the Perfect Stone to wear every day. They can take Quite a Beating! Rubies are Extremely Tough and hold up quite well. Another reason why Ruby is the King of all Gems! Ruby has always been associated with Elegance, Courage, Boldness, Action and High Energy. It’s Regal and Sacred, how could it not? Because Rubies are so Red and Intense, it’s meant to bring out Emotion, Love, Anger, Passion and Fury! Red ties after all, are Power Ties! 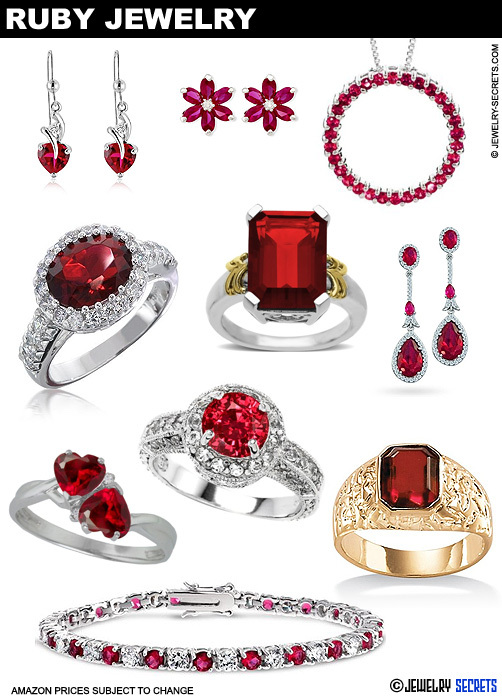 Rich Red Rubies command the Highest Per-Carat Price of any Colored Stone. 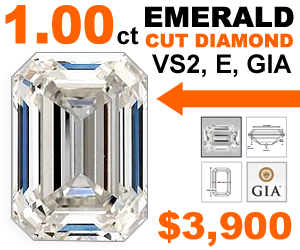 $10 per-carat for Low Quality, and up to $200,000 for Good Quality! It’s no doubt that Rubies were used for Coronation Rings in England. The Royalty demanded it! Rubies were thought to Guard Health, bring Peace and Happiness, as well as Passion and Devotion! It was thought that Rubies could offset the Reactions to Poison in the 15th and 16th Centuries! Legend even says that Rubies were used as a Prophecy in the Middle Ages. If the Stone turned Dark, Danger was Near!!! We all know that the Red color is caused by Chromium, but this Chromium is also the same thing that makes Rubies Fluorescent! Good Rubies give off a Red Fluorescence under a UV light (Black Light). 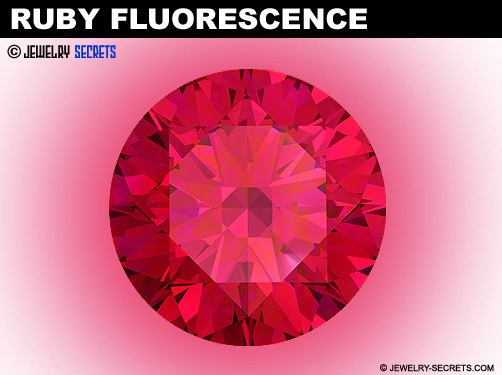 This Fluorescence helps give Rubies that Bright Red Glow that Rubies are known for. But most Rubies you find will not be this High Prized Possession that the likes of Switzerland seeks out (they want only the best). 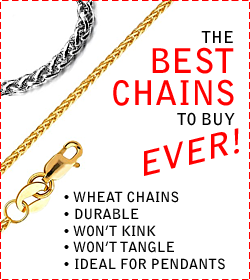 What you’ll find are Commercial Goods that have been Heat Treated and Enhanced. 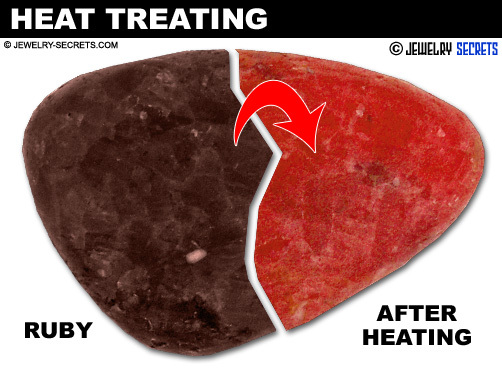 Heat Treating is a process where Intense Heat is applied to the Stone which Enhances the Color, Helps Hide Inclusions (like Needles and Silk) and gives the Stone a Permanent Color Change… All for the Good! Some Rubies that have Pits or Blemishes on the Surface will also be Oiled, Waxed or Filled with Plastic to help make the Stone Look Better, Appear Cleaner, and Feel Smoother. 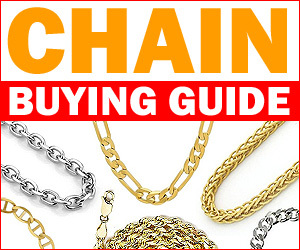 Interesting enough, Heat Treating is common and accepted in the Jewelry Trade. That’s just the way it goes. Rubies are found all over the World, but the Most Popular mines are located in: Burma, Thailand, Tanzania, Malawi, Madagascar, India, Cambodia, Vietnam, Africa, Afghanistan, Australia, Brazil, Kashmir, Mozambique, Nigeria and the USA. The only Commercial Ruby Mine in the US is in Utica, Montana, called the Yogo Creek or Yogo Gulch. These Stones are generally very Small and Bluish Purple in Hue. Not Very Popular or Pretty! Burmese Rubies really are what Gem Collectors Desire (Rubies of Mogok in Upper Burma). 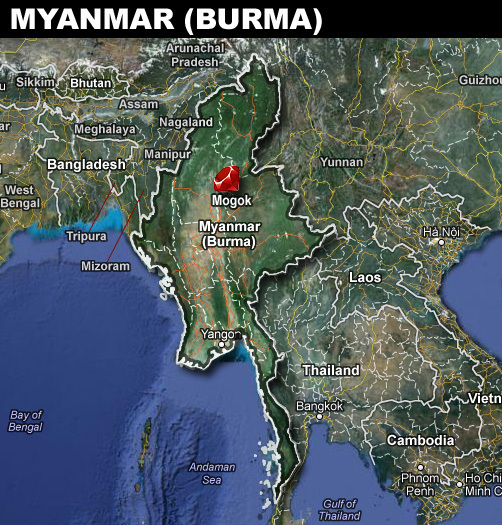 The Environment in Burma is Ideal for Ruby Growth. 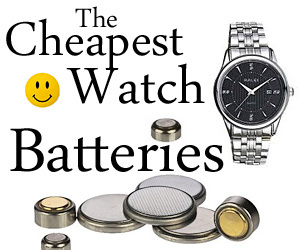 It’s the perfect setting of Low Silicon Content, combined with the Right Temperature and Right Pressure. It’s Amazing what a little Corundum can produce. Corundum is actually a Mixture of Aluminium and Oxide (Al2O3). Sadly, all Rubies don’t look like this, and most of the Jewelry Stores today carry Man-Made Rubies which are Flux Grown (the Hydrothermal Method). This Process Mimics what Nature does to Produce a Ruby. It just Bakes it in a Lab. The result is a Nice Looking Stone, with the same Chemical Composition as a Real Stone, but they are more Transparent and more Cleaner… Much more Clean! This is the Easiest Way to tell the difference between a Real Ruby and a Man-Made Ruby. If the Ruby is totally clean of all Inclusions and if it looks Glassy, Really Transparent or even Plasticy… it’s more than likely Man-Made! 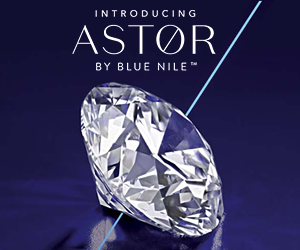 In fact, ALL of the Good Quality Precious Stones are so hard to come by that they have pretty much been replaced by Man-Made Stones (in the last 20 years or so). 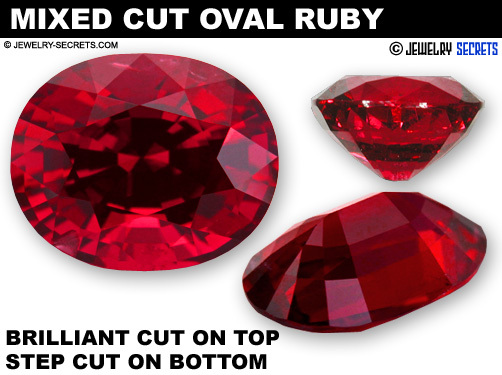 Common Cuts of Ruby are: Brilliant Cut, Oval Cut, Cushion Cut, Step Cut, Cabochon (Domed) Cut, Pear Cut, Marquise Cut, Trillion Cut, and Mixed Cuts. Mixed Cuts are a combo of Two Different Cuts, like in the image below. This Mixed Cut has a Brilliant Cut Crown and a Step Cut Base. Most Rubies, since they are Denser than Diamonds and have a Specific Gravity of 3.9-4.1, are usually Cut Deeper than a Diamond is… to bring out the Color of the Stone. So if you put a Ruby up against the same mm Diamond, the Ruby would weigh more. 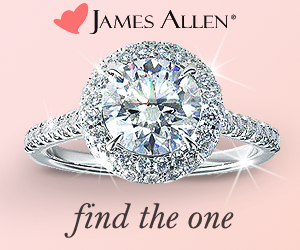 Often you’ll even see Rubies Replace Diamonds in Engagement Rings. 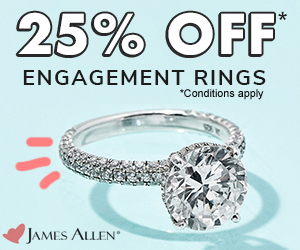 It’s a Perfect Romantic Gift! A Ruby set in the center of a Wedding Set, or set on the sides of Wedding Rings makes a great contrast to the Diamonds. It adds “POP” to the Ring! Why not? The Color of Red intensifies Love and Compassion. It just goes hand in hand. The Hindus Cherished the Color of Ruby so much that they believed that Rubies would bring you back in your next life as Emperors! One thing you will find if you look at enough Gemstones, is that there are a lot of Red Gemstones that look and appear just like a Ruby. Stones like Red Spinel, Garnet, and even Pink Tourmaline. You can quickly see that it would be easy to Mix these Stones up. But it didn’t Stop Peter the Great! The Russian Czar carried a Loose Ruby in his pocket as a Talisman. I would bet that the Origins of this Stone are unknown. Was it a Burma Ruby? Who knows! 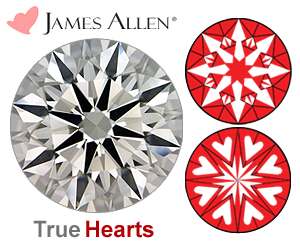 With Stones ranging from Light Pink to Deep, Dark Red, you just never knew what you were getting. 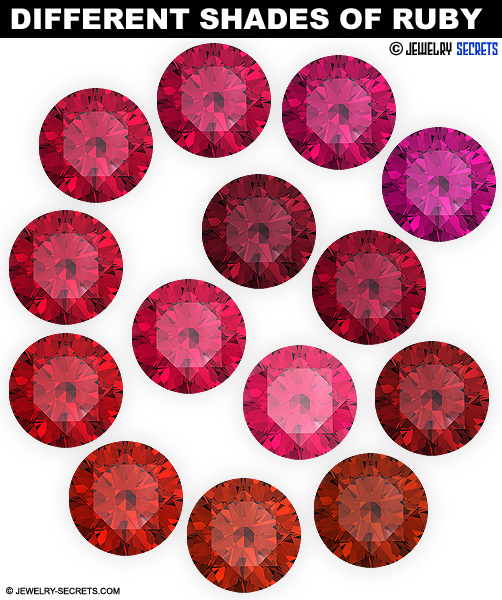 It’s a good thing that GIA uses Master Stones to Grade the Colors of Ruby. 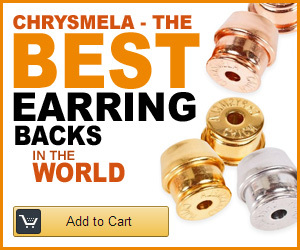 Because determining what a piece of Light Pink Corundum is, could get tricky. 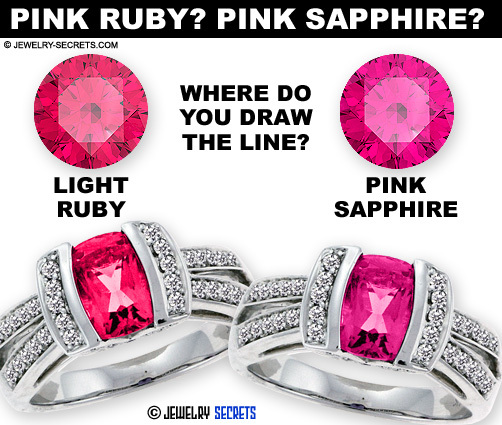 A Light Pink stone could be either a Light Ruby, or a Pink Sapphire. Gem Dealers are at odds on where to draw the line. Would you know the difference between them? Both of these stones are found in Metamorphic Rocks like Marble, Schist, and Gneisses, and they’re both Perfectly Safe to Ultrasonic, but one stone could be Double the Price of the other! That’s a Pretty Big Mistake to make! This is also why I suggest staying away from Light Red Rubies. Stick to Medium Shades or Darker Shades (as long as they don’t look Purple or Black)… If you can help it! Your Chakra asks for it! Ruby, because of it’s Beautiful Red Hue, works Perfect for the Gemstone for the Base Chakra (also called the Root Chakra, First Chakra, Foundation Chakra, Earth Chakra, and Mulad Hara Chakra). The Base Chakra sits in Front of your Tailbone, at the Base of your Spine. Because of it’s Prime Location, it helps give you Strength and Determination! Many people like to think of it as a New Beginning! This Chakra’s Keywords are: Survival, Sexuality, Health, Abundance, Change, Moving Forward, Safety, Family, Security, Nurture, Assertiveness, Passion, Practicality, and Tradition. Ruby Chakra Stones help Stimulate the Flow of Energy! It removes Anxiety and Stress. 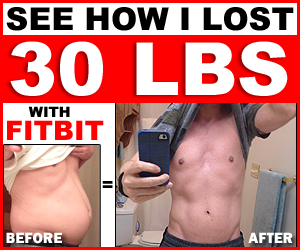 It promotes Positive Changes and more. 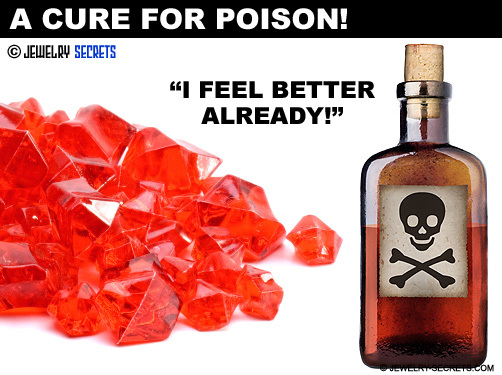 Symptoms that Ruby “supposedly” Cures are: Lower Back Pain, Sciatica, Water Retention, Diarrhea, Constipation, Impotence, Immune Disorders, Insecurity, Depression, Panic Attacks, and Phobias! 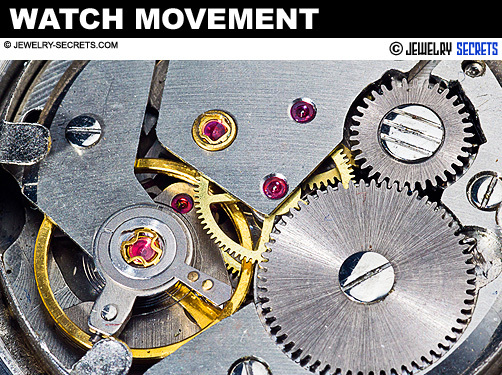 Rubies Clean the Body and keep it Balanced and Rooted. Read MORE about Chakra Here! Isn’t it time you Bought yourself a Ruby? 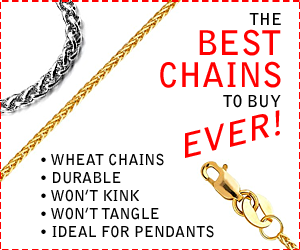 Amazon has some Great Looking Ruby Jewelry for some Great, and Cheap, Prices.